Looking for something refreshing, simple, and healthy to go with your chicken, fish, or steak main? Look no further! This orzo salad with feta, asparagus and chickpeas is the perfect choice! Cook the orzo according to the packet instructions. Drain and rinse in cold water, then add to a large bowl. Meanwhile, prepare the asparagus. Griddle or pan fry in a tiny bit of olive oil until tender and slightly charred (about 10 minutes). Chop into small lengths (a few centimetres each). Let cool for a few minutes while you prepare the rest of the ingredients. 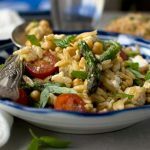 Add the tomatoes, feta, asparagus pieces and basil to the large bowl of orzo with the drained chickpeas / garbanzo beans. Serve with chicken, fish, steak, or whatever you like, and fresh crusty bread. Delicious! *I like to pour about half to two thirds of the dressing over the salad, then let everyone add a bit more to their own portion if they like. Mr. Scrummy doesn’t like too much balsamic dressing on his salads, but I like a bit more! This salad keeps quite well in the fridge for two or at a push three days (I polished off the leftovers on day 3 and it still tasted really good! ).